Trim the roots from the coriander, wash it well, pat dry with a clean tea towel and set aside. Lay all your prepared ingredients out on a plate. Place 1 rice paper round in a shallow bowl of lukewarm water for about 10 seconds. When you pull it out of the water, it will still feel firm. It will soften as you work with it though and it is much easier to work with this way. Place it down flat onto your bench top. Put equal amounts of each of the ingredients down the centre of the rice paper round. Make sure there is space at the ends and don’t be tempted to over fill it, or you will have trouble rolling it. 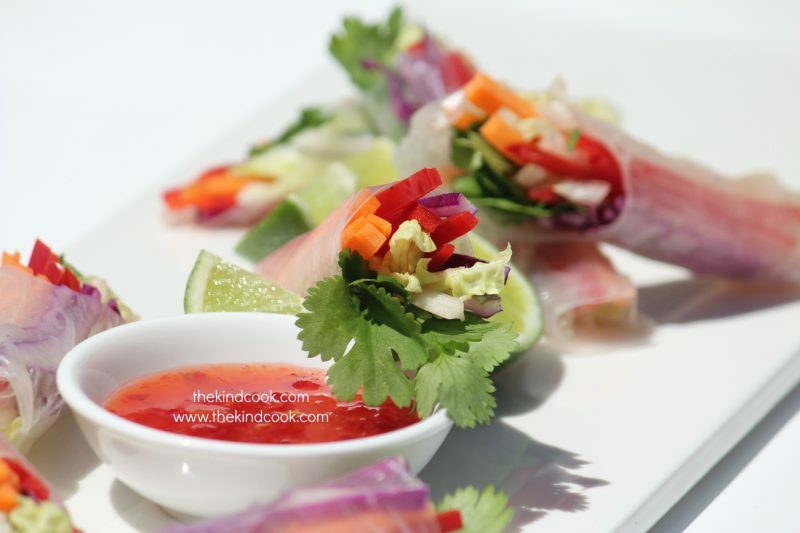 Fold the ends of the rice paper in and roll up firmly, to enclose the fillings. Repeat with the remaining rice paper rounds and fillings. Serve with fresh lime and/or organic tamari or sweet chilli sauce. Notes: You can purchase rice paper rolls at Asian supermarkets and in the Asian section of most supermarkets. If you want the fillings to show, you can place the ingredients all to one side of the rice paper round and only fold one side of the round, before you roll it. This is great for parties and gatherings, but for lunches its best to enclose all the ingredients. For a more filling snack or lunch, add a small amount of vermicelli rice noodles to each roll.